The #Gatton2021 application process is now closed! If you are a Class of 2022 prospective student (current freshmen), please check back on August 1, 2019 for the link to the Class of 2022 Application Request! Instructions for the link: Please complete the form at the link above in full. Once you complete the form, a message will appear in your browser. At the same time, an email will be sent to the email submitted in the application request detailing the next steps to take, including a link that will take you to the online application portal through WKU. We strongly suggest that you both bookmark this link (as it will be your access point to the application throughout the application process) and write down your login ID and PIN. These are both vital in the process. Below you will find our Admissions team's instructions for each of the required materials for application. Once you click on a box, the box itself will expand to include all relevant instructions and suggestions. The link from the email sent following completion of the Application Request will take you to a screen that says "WKU Admissions Application." Under that title, you will see a phrase that states "To start the online Gatton Academy application process: Create a login account at application account creation." Click on the account creation link. Once on the following screen, you will be prompted to create a Login ID and Pin. Write these down in an important place, as it will be difficult to recover these after account creation. Your Login ID can be anything (we suggest using either your name or a variation of it so you don't forget), and the PIN number must be (all numbers) between 6 and 15 characters. Following the creation page, you will be directed to fill out your full First, Middle and Last Name along with the application term of Fall 2017 (this would be your first semester on campus). This will grant you access to the application portal. While you can type directly into the fields, we HIGHLY recommend that all applicants copy and paste each activity/award from a Word document to the application. There is a time limit on each page, and it will refresh if you take too long, which is why we suggest copying and pasting from a Word document, once you see the format. While you can type directly into the fields, we HIGHLY recommend that all applicants copy and paste the three essay prompts and the one short answer prompt into a Microsoft Word document. This allows for refining of the essay over time. Once you are ready to submit your application, an applicant can simply copy and paste the answer for each essay prompt from the Microsoft Word document to the submission fields. Each essay has a limit of 4,000 characters, including spaces. You must fill out all of these sections prior to submitting your application. This application does allow you to leave the application and return at a different time. At the bottom of the screen, you will see two options. If you wish to return to the application, hit Finish Later. Once all sections are completed to your satisfaction, you can click the Submit Application button. You should only do this once your entire application is completed to satisfaction. Once submitted, you will not be able to go back and change any information. You are required to have an official ACT or SAT score on file with Western Kentucky University. Students should consider doing testing in October, November, or December. The Gatton Academy advises applicants to test prior to January if possible. Please submit SAT and ACT scores directly to WKU. Submit ACT scores to code 1562. Submit SAT scores to code 1901. The Assistant Director of Admissions will have access to all scores sent to WKU and will be able to record them for The Gatton Academy's purposes. 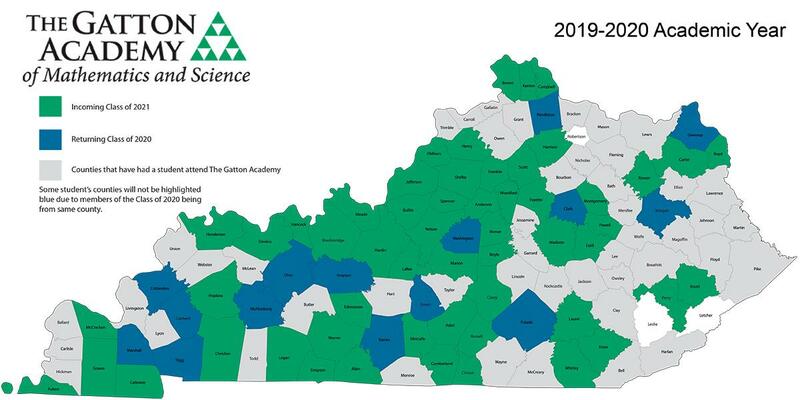 The Gatton Academy will use the highest score in each individual section of the ACT and SAT rather than the highest overall scores. With that being said, we do not superscore (take the best individual scores and make a new composite). The writing portion of the ACT and SAT is not required for admission to the Gatton Academy. Upcoming SAT and ACT dates are listed on the Timeline page. ACT - Go to https://www.act.org/content/act/en/products-and-services/the-act/scores/sending-your-scores.html and place an online request for the scores to come to WKU. The code for ACT scores to go to WKU is 1562. Once submitted it may take a week or two to be processed by WKU and then processed by The Gatton Academy. SAT - Go to https://sat.collegeboard.org/scores/send-sat-scores and go down to the rush reporting section on this webpage. The code for SAT scores to go to WKU is 1901. Once submitted it may take a week or two to be processed by WKU and then processed by The Gatton Academy. PSAT - Send .pdf version of your scores to academy@wku.edu. PSAT scores are not required and are only used if the admissions committee wants to view them. A guidance counselor, administrator, a supervisor in the applicant's school or community leader (i.e., a scout leader, pastor, youth group coordinator), or another teacher who can comment on the applicant's general academic aptitude, leadership ability, emotional maturity, integrity, and preparation for the rigorous academic program offered by The Gatton Academy. Gatton Academy Recommendation Form (Educator version or Community Leader version). The Gatton Academy also encourages applicants to ask for recommendations from more than these two people to avoid missing the deadline and to ensure that the Admissions Committee receives the applicant's most representative academic profile; however, please send no more than four letters of recommendation. Please be sure that those persons completing your recommendations understand the nature and rigor of The Gatton Academy. As a courtesy, please provide individuals writing letters of recommendation with as much time as possible before the deadline. You are encouraged to discuss the academic requirements of The Gatton Academy with those persons completing their recommendations and to direct them to the Gatton Academy website. Any mail sent to The Gatton Academy may take up to 10 business days to process. As long as it is postmarked on or before February 1st, it will still be counted. An official transcript of grades from your freshman and sophomore year should be submitted to The Gatton Academy by your guidance counselor. Additionally, if your transcript does not show what classes you are taking for the spring semester of your sophomore year, we request that you send in your current class schedule. Transcripts and schedules should be submitted in January of your application year to include grades for the Fall semester of your sophomore year. A final transcript of your completed sophomore year is required for admission. Parchment (VIA EMAIL) - For those schools who use Parchment, we can accept Parchment BUT they must be sent digitally (via email) to academy@wku.edu. If they are sent to WKU as an institution, we cannot guarantee delivery to our office at The Gatton Academy (they would go to WKU Admissions) and it may not count toward your requirement. Any mail sent to The Gatton Academy may take up to 10 business days to process. As long as it is postmarked before February 1st, it will still be counted. Both you and a parent should review and complete the Release of Confidential Information form. A completed copy will be emailed to you and the Gatton Academy. Please note that the "digital signature" means simply typing in your name in the fields provided. After the February 1st deadline, the Admissions Committee will review all applications and select students to participate in formal interviews in late March. Students will be notified by email (in the evening) regarding interviews in mid-February with interviews occurring in late-February/early-March. By mid-March, the Admissions Committee will select the incoming class. Applicants will be notified of their final status by email on or before April 15th.